California homestead real estate law helps to protect non-consensual creditors that attempt to force you to sell your home or attach sale proceeds to collect on a debt you owe. California homestead real estate law does not protect your home from voluntary liens, such as a mortgage or deed of trust, mechanics’ liens, federal tax liens and judgment liens for child or spousal support. It’s important to remember that California homestead real estate law does not prevent the involuntary (“forced”) sale of a home by a creditor when the property can be sold for an amount that would satisfy all prior liens and the California homestead real estate law exemption amount. In that case, the home’s subject to an execution sale. The creditor gets paid-off through the proceeds. Not all is lost, however. The homeowner retains the exemption amount to buy another home. The owner has to work fast because there’s a 6 month window to reinvest. Easy enough? Just kidding. This stuff’s complex. Let’s get into the details. There are two types of California homestead real estate law protections – automatic and declared – that have differing requirements and benefits. The automatic California homestead real estate law doesn’t require the recording of any document. The homeowner “automatically” qualifies for the exemption based on “residency” under Cal Code of Civil Proc. 704.710(c)). The declared homestead, on the other hand, necessitates that the homeowner records a homestead declaration. The benefit to recording a declared homestead is that it provides protection from creditors when you voluntarily sell your home, as well as when a creditor attempts to force the sale of your home to satisfy a judgment lien. Ordinarily, when a homeowner voluntarily sells their home they have to pay-off all judgment liens to transfer clear title to the buyer. If a homeowner records a homestead declaration before a judgment creditor places a judgment lien on the surplus equity of the home, the owner’s equity up to the exemption amount is off-limits to the creditor when the homestead is voluntarily (or “forcibly”) sold and for six months thereafter. Contrary to the declared homestead, the automatic homestead protection only applies to forced sales (not voluntary sales by the homeowner). This means the proceeds from a voluntary sale will go to a judgment creditor rather than the homeowner if a declared homestead is not recorded. Again, California homestead real estate law does not stop creditors from forcing the sale of your home. It merely allows a homeowner to use the exempt amount to purchase another home within 6 months of the sale. So, what is the California homestead real estate law exemption amount? You’re 70 years old and retired. Unfortunately, you just had an auto accident where you injured a pedestrian, who files suit and obtains a money judgment for $50,000. You don’t have any cash, but you own a home worth $200,000. You owe $100,000 on your mortgage. The pedestrian (also known as judgment creditor) gets an abstract of judgment and records it in the County where your home’s located. This creates a judgment lien on your home. 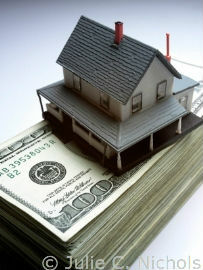 The pedestrian next tries to obtain a court order to force the sale of your home to satisfy the $50,000 judgment lien. At the hearing, the court reviews the fair market value of the property and amount of automatic exemption available to the homeowner. A judgment creditor cannot force the sale of your home, unless the home can be sold for an amount that would “satisfy” (i.e. is greater than) the amount of the exemption and all prior liens. Let’s crunch the numbers. Since there’s not enough equity in your home after accounting for prior liens and the exemption amount, the creditor cannot force the sale of your home. Result. You get to keep your home. What if you have enough equity in your home to cover the prior liens and exemption amount? Take the same facts, but assume you’re home is worth $325,000. In this instance, your home may be sold at an execution sale to satisfy the pedestrian’s $50,000 claim. However, you keep the exemption amount ($175,000), which can be used to purchase another home within 6 months. If you reinvest the proceeds into a new homestead within the 6 month period, the exemption benefit continues into the new property even if there is a recorded judgment lien recorded prior the acquisition of the new property. If you fail to reinvest the proceeds into another home within 6 months, the California homestead real estate law protections are lost and the funds are available to creditors. Assume the same facts as above, but you owe the pedestrian $150,000. The pedestrian creditor forces the sale your home and gets $50,000. You still owe the pedestrian $100,000. You reinvest the full California homestead real estate law exemption amount ($175,000) into another home worth $175,000 within 6 months of the initial forced sale. You retain $175,000 (exempt amount). The pedestrian cannot force the sale of your new home to recover $100,000. This does not mean the creditor won’t ultimately get paid-off if the property rises in value where the proceeds from a forced sale is greater than the liens and homestead exemption amount.